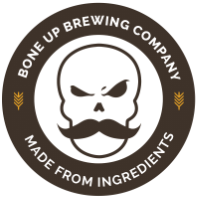 Stats: Jeff - Bone Up Brewing Co. Cheese Pairing: Provolone, the "Jeff" of cheeses. Food Pairing: BLJ or Beef on Weck. Music Pairing (Jared's Choice): "Summertime" by DJ Jazzy Jeff and The Fresh Prince. Best Occasion to Drink: While watching superhero movies. Brewers' Notes: When we give beers people names, we usually have a cool story or some sort of weird, high-concept nonsense, but that's almost entirely not the case here. So here's the details in handy-dandy Q&A format! You know that guy? That guy Jeff? We named this beer for Jeff! Are you thinking of a specific Jeff? I think it's funnier if we don't answer that. Does Jeff know about this? Why would you write a Q&A if you're not going to answer any of the questions? It's what Jeff would have wanted.